Halau Ku Mana eighth-grader Kaila Garcia vacuums in one of the hallways of the charter school. With a lack of sufficient funding for custodial staff, students of the Manoa school must take part in "wa kuleana" (time to take care of one's responsibilities) when they help clean the school. 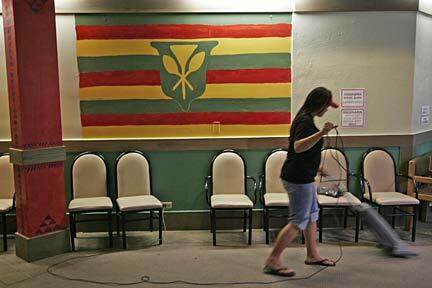 Hawaii's first charter schools turn 5 years old today but don't feel they're getting much of a birthday gift. Despite a slight rise in funding in the state budget passed Tuesday, public charter school advocates expressed anger and frustration over funding levels that they consider woefully inadequate, and are bracing for another two years of scraping by. "They'll be stuck in survival mode, which limits your ability to focus on instruction, and the direct impact of that underfunding is on the kids," said Jim Shon, executive director of the Charter School Administrative Office. The state budget allocates about $31 million in operating funds in each of the next two years for Hawaii's 27 quasi-independent charter schools, up from $28 million in the current fiscal year. But school administrators say far more is needed to make up for funding that has for years fallen short of levels mandated by state law. Charter schools are public schools that enjoy autonomy from the state Department of Education on curriculum, spending and personnel decisions but have struggled to make do with per-pupil funding amounting to about half that of regular public schools. They had hoped to take a step toward equity through a new funding formula passed this session, which Shon said obliges the Legislature to provide about $45 million in each of the next two years. But a series of public-employee pay raises left no money for that. "What's that supposed to mean, that we don't deserve equity? That our kids are not worth as much?" said John Thatcher, principal of Connections charter school in Hilo, one of the first group of five charter schools established five years ago. Two positive developments for charter schools are provisions in the law that relieve them of having to use their own operating funds to pay for employee benefits and the recent 10 percent raises for public-school teachers. "Paying for the fringe benefits has been a real detriment to charter schools, so that appears to be a positive. But until we get the check, we don't know for sure," said Curtis Muraoka, co-director of West Hawaii Explorations Academy in Kona. However, charter schools are growing rapidly, and Thatcher said he expects the schools will have to ask for more money during the next legislative session. A report by the CSAO projects charter school enrollment to grow each year, rising from 4,964 during the current school year to 7,335 by 2009, with nearly all the new students coming from regular public schools. Legislators' hands were tied this session, said Roy Takumi (D, Pearl City-Pacific Palisades), chairman of the House Education Committee. "We did what we could, but there wasn't any more money available," said Takumi, who questioned why Gov. Linda Lingle, a supporter of charter schools, was not more prudent in negotiating the new teacher salary deal. "She was saying (raises for government employees) would break the state, and then she goes out and negotiates an even bigger raise for the teachers. You've got to wonder about that," he said. Despite charter schools' rapid growth, some school administrators say a lingering lack of understanding of such schools hampers them in the biennial competition for state funding. A recent survey by the Washington-based Center for Education Reform said that only one in five people in the country was even aware that charter schools were part of the public school system. But Connections' Thatcher said charter school performance speaks volumes: Charter school students scored higher on state achievement tests last year than their peers in regular public schools. "If we turned that around, you could say charter schools are doing a pretty good job of educating their kids, at half the cost of what the DOE spends per student," he said. "Maybe we should be talking about massive conversion to charter schools."